Hello and welcome to Day 4 of our September Digital Stamp Release Showcase! This is my card in tribute to the 4th and last day of the Whimsy digital release day.The creations over the past 4 days have been absolutely incredible thanks to a wonderful talented team of digital card designers. I applaud each and every one of them. I love working with them all. This card is made using a Whimsy Digital image from Lia Stampz called Boys. This is a little embellishments that I made to hold the brad, I really love making these they work wonderful if you punch the edge of the strip with a border punch first then accordian fold the paper. I made this one a little small to do that though. Embellishments: K & Co epoxy stickers, Little Yellow Bicycle Brad. Thank you for stopping by, great to see you. 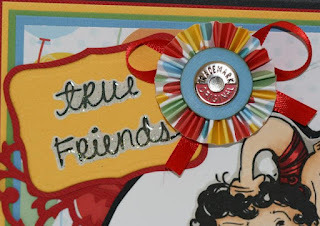 Great image, just right for a boy's card and I'm going to have to try to make an embellishment like yours, love it! Wahoooooooooooo nice job again....love the image great coloring...fun stuff!